Al-Farouq Aminu hit a pair of late 3-pointers and finished with 11 points and nine rebounds to help the Portland Trail Blazers win their fourth straight game as they held off the Boston Celtics 100-94 on Sunday night. Jayson Tatum matched his regular-season career high with 27 points and Kyrie Irving added 21 for the Celtics, who finished their road trip with a 1-4 mark. The Blazers, who wrapped up their homestand with a 5-1 record, led by as many as 21 points in the game, but the Celtics went on a 13-2 run to start the fourth quarter and pulled to 85-83. Marcus Morris’ 3-pointer tied it at 86 with 7:27 left, but Lillard answered with a basket to keep Portland in front. Irving’s 3-pointer with 2:55 left closed the Celtics to 92-91. Aminu came back with a 3-pointer from distance for the Blazers. He made another key three that put Portland up 100-94 with a minute left. Lillard’s layup put the Blazers up 23-12 in the opening quarter and Portland led by as many as 12 points before Boston closed the gap to 28-26 on Terry Rozier’s floater. It didn’t last long as Meyers Leonard’s 3-pointer gave Portland a 40-31 lead midway through the second quarter. The Celtics, who had won three in a row against the Blazers, got to 61-52 in the third quarter after Tatum’s 3-pointer, but CJ McCollum answered with a three for the Blazers. Kyrie Irving’s long-range basket closed the Celtics to 71-66, one of seven 3-pointers Boston had in the third. 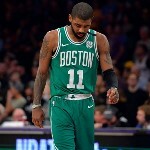 The Celtics, who shot 14 of 42 from beyond the arc in this game, have been having shooting problems and struggling offensively during their entire road trip. Portland was coming off a 116-105 victory over the Los Angeles Clippers on Thursday, while Boston was coming off a 123-115 loss to the Jazz, which marked Gordon Hayward’s first trip back to Salt Lake City after going to Boston as a free agent in the summer of 2017. Hayward fractured his tibia in the Celtics’ opener and missed all of last season.